A Disney Cruise Line® 14-Night Eastbound Transatlantic Cruise, departing May 14, 2011, takes you on a voyage aboard the Disney Magic® to 5 exciting ports of call on both sides of the vast Atlantic Ocean. Ports include, Disney’s Castaway Cay; Madeira, Portugal; Cádiz, Spain; Gibraltar, U.K. and Barcelona, Spain—plus 8 relaxing days at sea. For a limited time with this sailing, book an Inside Category with Restrictions stateroom from $799* per person based on double occupancy. Contact Pixie Vacations for this limited offer. 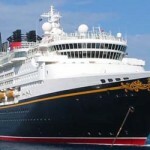 Specific inside stateroom will be assigned at a later time by Disney Cruise Line, based on availability. Requests for a specific stateroom location cannot be accepted. Gratuities, Government Taxes and Fees and port adventures are not included. The number of staterooms allocated at this rate is limited.